two old people in a station at midnight? Rachel Leclerc grew up in the Gaspé and now lives in Montréal. 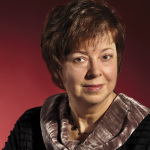 She has published seven books of poetry, for which she has received numerous awards, including the Prix Émile-Nelligan, the Prix Jovette-Bernier, the Prix Alain-Grandbois and First Prize in Radio-Canada’s Poetry Competition. She has also written five novels. Susan Lemprière is a writer and translator who lives in St-Mathieu-de-Beloeil, Quebec. An earlier version of this poem was a finalist in the Malahat Review’s 2014 Les poésies francophones du Canada: A Translation Prize. She is currently working on translating Rachel’s collection Les vies frontalières (Borderlives).